If you’re a busy person (like me), then the thought of cooking after a long day of work is a daunting task to say the least. 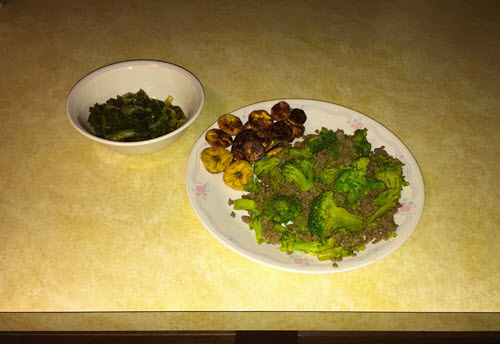 I’m not going to sugar coat it (no pun intended), cooking big meals takes some time… especially when you first start out on switching over to whole foods diets like SCD, Paleo or WAPF. It’s one of the reasons why beginner cooks can feel very overwhelmed. I know that it took me many months to really start to grasp these different areas. 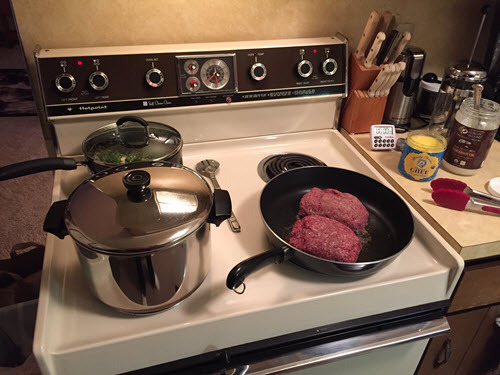 When I was first starting, I had food spoiling on me, half of my food would be cold by the time I got the rest ready and I struggled to cook more than two things at once. Luckily, as long as you give yourself some grace and keep trying, the skills will develop. Brent is one of our amazing team members, and he’s really talented in the kitchen. I asked him to come up with a diverse meal that didn’t demand a bunch of fresh ingredients. He delivered with this delicious meal. 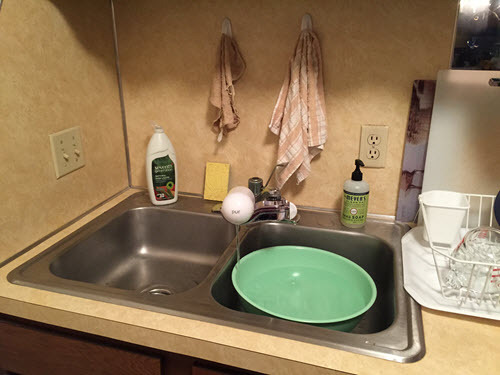 Not to mention, he detailed it so that you can see step-by-step how he worked around the kitchen to make sure everything was ready to eat at the same time. If you’ve never eaten Endive… you are missing out, trust me. Note: I encourage you to substitute for any of these ingredients. In fact, if you’re just starting out, then we highly recommend removing the plantain, it’s a starch and technically isn’t SCD legal. Step 1: Fill a large bowl with filtered water to rinse your endive. Step 2: While your bowl is filling, add 1 to 2 Tbsp of ghee and 2 Tbsp coconut oil to your large pot, and turn on one of your front burners to low-medium heat. Once the oil has warmed up, using scissors, open your frozen, organic broccoli and add to pot. Sprinkle a little sea salt evenly. Caution: While I add the frozen broccoli right to the pot as the oil is heating up, be advised there are safer ways of doing this (and more recommended.) If you choose to do it this way, be sure to cover right away and do NOT add to hot oil. Cover and stir occasionally to ensure broccoli doesn’t burn and stick to bottom of pot. Keep at low-medium heat. Step 3: Time to prep your endive! Using your sharp knife and cutting board, cut the end of the endive off. That’s right, we’ve got those plantain on deck. In your medium pot, add a few Tbsps of olive oil and place next to the sink. Thoroughly hand wash your endive in the large bowl of filtered water, getting rid of dirt and debris. As you clean, break the leaves of endive in half and fill the pot as you go. Note: Don’t try to wash the entire bunch of endive all at once – trust me it’ll be a mess and take longer to clean. Once you’ve finished cleaning, place the pot on one of the back burners at medium heat. Step 4: Preheat your oven to 325-350°F. Then, grab your parchment paper and tear off a piece to cover the entire surface of your baking sheet. Pour some olive oil (or any healthy fat) on the parchment paper. 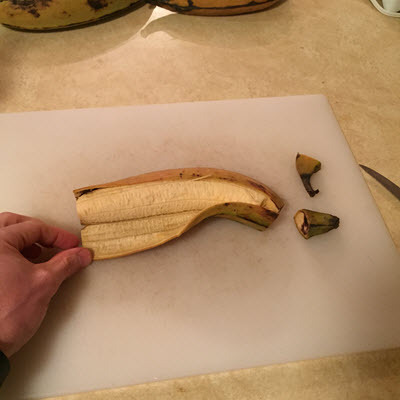 Next, peel the plantain, like I did in the picture here. Remove the ends and cut the peel lengthwise – if you’re lucky, the peel will come off in one piece. 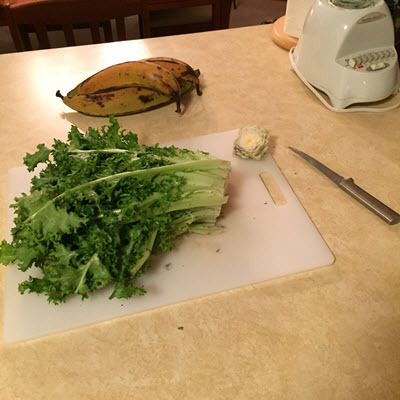 Slice your plantain to desired thickness (I like about 3/8”… not too thick or thin). Place your slices on the baking sheet and sprinkle a little sea salt on top. 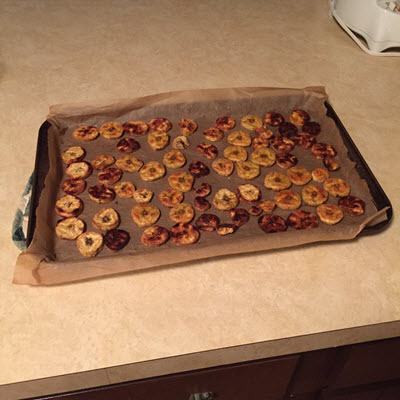 Put your plantain in the oven for 20 mins and flip when they begin to slightly brown. Step 5: Put your large frying pan on your other front burner on medium heat, and add approximately 2 Tbsps of coconut oil and 1 Tbsp of ghee. Once your fat has warmed up, add your 2 lbs of ground buffalo to the frying pan. Using your spatula, chop up the meat and add sea salt to taste as you brown the beef to desired level of doneness. 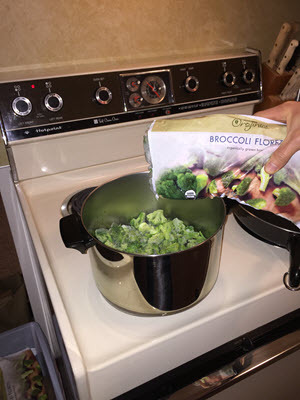 Once the buffalo is browned, transfer the cooked broccoli from the large pot to the frying pan. Turn your burner to warm-low heat and occasionally stir with your spatula. Keep an eye on the endive and flip using your tongs. Step 7: Everything will be nice and hot and ready to plate at this point. Remember to turn off your burners and oven and most importantly enjoy a delicious meal that you’ll have plenty of leftovers of. You can mix it up and substitute for pretty much every ingredient, and simply use this process as a template for creating meal after mouth-watering meal. Let us know what you thought of the meal and if you came up with your own variations. We’d love to hear about your creations. P.S. 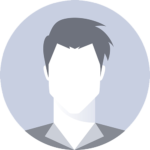 – If you want even more help with your meal planning, check out our other free recipe ideas and our ready-for-you meal plans. Where would one go about getting good quality Buffalo whilst not in the USA (Australia) ?? I thought plantains were not allowed on this diet? Please advise. Hi Julie, some recipes we post are for more advanced folks on the SCD diet. If you are just starting out and have a bit more healing to do, you can try substituting another veggie for the plantains. 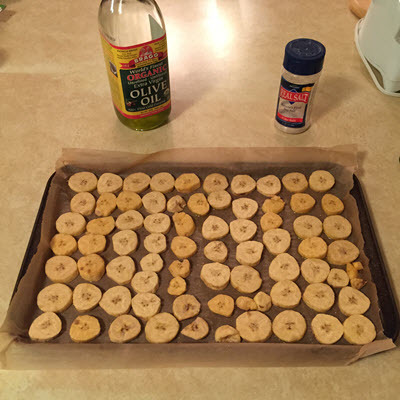 Lori – Plantains are not an advanced SCD food, they are illegal. This should be pointed out in the recipe. In fact, it seems odd to have illegal foods used in dishes highlighted by a website called “SCDLIFESTYLE”! 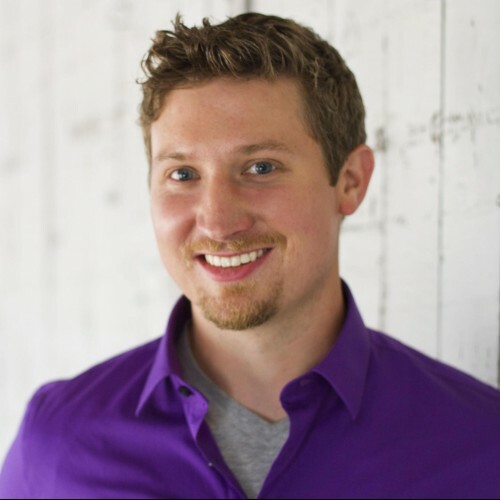 Hi Allen – we don’t follow SCD strictly according to the legal/illegal list. We believe in using SCD as a framework for healing and absolutely respect the power of the diet as a healing tool – but we think most people can eventually add in some other foods (like plantains and other starches). Green Plantains breadkdown past the small intestine unlike potatoes, hence don’t feed candida, good as a healing food… plantain soup is great, they are also known to heal ulcers. ripe = more sugar. You steamed the endive? Never have heard of eating it anyway but raw, in salads! 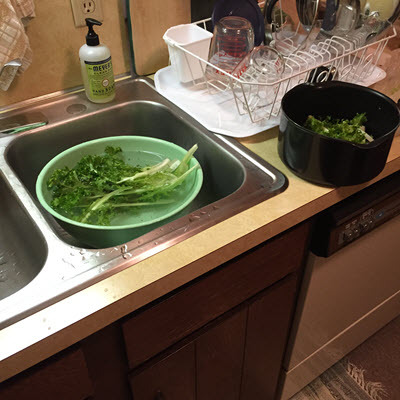 A former Chinese housemate cooked lettuces, but have not come across again until now. Is this a blanching type of cooking? It’s great Kate! 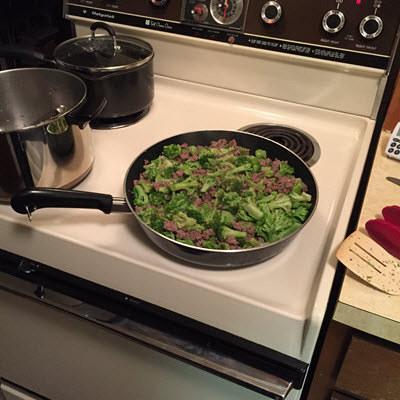 I’t more a steaming/sauteeing type of cooking… you can do fresh garlic and olive oil sauteed before you add the endive. Escarole is great this way too (actually by far my favorite). Thanks Stephanie! Let us know if you give this combo a try and what you think.